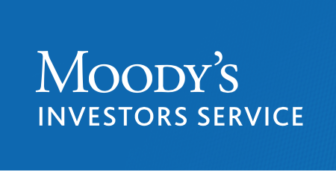 A major Wall Street credit-rating agency, Moody’s Financial Services, has upgraded Hartford’s bond rating in response to a new state plan to retire the capital city’s bonded debt. The city had a rating of Caa3, which is considered junk bond status and is 13 steps lower on Moody’s ratings scale. A more favorable bond rating could help the city borrow at lower interest rates when financing future projects through the sale of bonds on Wall Street. 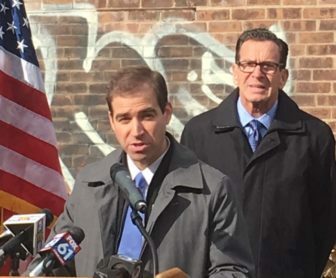 Since the fall of 2016, Hartford Mayor Luke Bronin has warned that without additional assistance from the state, the city’s finances were at risk of insolvency in the 2017-18 fiscal year. But that debt assistance plan, recently signed by Gov. Dannel P. Malloy’s budget office and by state Treasurer Denise L. Nappier, has been a source of contention at the state Capitol. Some legislative leaders from both parties have asserted the deal, through which Connecticut would pay off about $550 million in city debt over the next two decades, went beyond the level of assistance legislators intended. 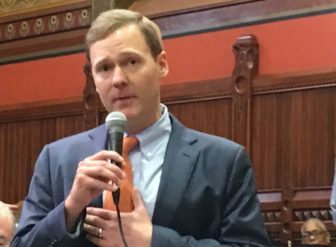 House Majority Leader Matt Ritter, a Hartford Democrat, supports the debt assistance deal and says it does reflect the legislature’s intent. “If the ultimate goal in the bipartisan budget was to avoid bankruptcy, put Hartford on a more stable path, and ensure massive infusions of state money are not needed year after year, this is a step in the right direction,” Ritter said Thursday of Moody’s announcement.